What You Need to Know about Severe Vertigo? Different Levels of Vertigo and Dizziness – Are You Suffering from Severe Vertigo? Most people without vertigo don’t understand how serious the condition can get. For them, vertigo just means dizziness. And everyone experiences that occasionally. But how severe is your vertigo? Is it just a mild condition that will pass or is it a dangerous medical condition you need to address right away? Loss of balance conditions range from dizziness to mild vertigo to moderate vertigo to severe vertigo. Dizziness is the type from which most of us suffer at some point. 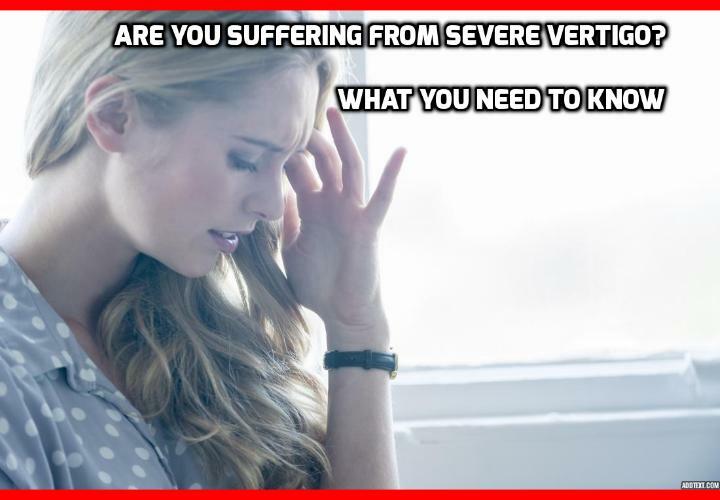 According to the American Family Physician, “Dizziness”, “lightheadedness”, or “disequilibrium” are accurate terms, as the physical conditions responsible for genuine vertigo usually cause episodes that are frequent and longer lasting. If you are often anxious, if you have hyperventilated during exercise, if you have suddenly dropped your blood pressure by getting up too fast, if you have had flu, or if you have taken fast-release antihistamine tablets, diuretics, blood pressure medication, opioids, and so on, you know how this feels. You are off-balance, you feel like you are losing consciousness but, according to WebMD, unlike in real vertigo, you do not feel like you or the room is moving. These episodes are normally short, infrequent, and associated with a specific cause. The American Family Physician recommends that you treat it by removing or avoiding the cause, such as the medication. According to WebMD, real vertigo occurs when the different balance and position-sensing systems of your body send inconsistent messages to your brain. Not only do you feel like the room is moving while you are stationary, but you might also feel nauseous and have rapid eye movements. Mild vertigo often passes quickly, and while it is unpleasant and potentially dangerous while driving or climbing ladders, it does not force you to sit or lie down. After conditioning your body to constant or fast movement, such as on a boat or a roller-coaster, this type of vertigo often occurs when you stop. In both moderate and severe vertigo, you must lie down or sit down with your head against a headrest. The difference then lies in the time it takes to improve and in the severity of the symptoms. It normally coincides with nausea and even vomiting. Vertigo and dizziness are the number one cause of broken bones in people over 60. They frequently lead to fractured sculls and even death.